Ancient legend paints a picture of a magical bird, radiant and shimmering, which lives for several hundred years before it dies by bursting into flames. It is then reborn from the ashes, to start a new, long life. So powerful is the symbolism that it is a motif and image that is still used commonly today in popular culture and folklore. The legendary Phoenix is a large, grand bird, much like an eagle or peacock. It is brilliantly colored in reds, purples, and yellows, as it is associated with the rising sun and fire. Sometimes a nimbus will surround it, illuminating it in the sky. Its eyes are blue and shine like sapphires. It builds its own funeral pyre or nest and ignites it with a single clap of its wings. After death, it rises gloriously from the ashes and flies away. It is believed that the Greeks called the Canaanites the Phoenikes or Phoenicians, which may derive from the Greek word ‘Phoenix’, meaning crimson or purple. Indeed, the symbology of the Phoenix is also closely tied with the Phoenicians. Perhaps the earliest instance of the legend, the Egyptians told of the Bennu, a heron bird that is part of their creation myth. The Bennu lived atop ben-ben stones or obelisks and was worshipped alongside Osiris and Ra. Bennu was seen as an avatar of Osiris, a living symbol of the deity. The solar bird appears on ancient amulets as a symbol of rebirth and immortality, and it was associated with the period of flooding of the Nile, bringing new wealth and fertility. The Greek historian Herodotus wrote that priests of ancient Heliopolis described the bird as living for 500 years before building and lighting its own funeral pyre. The offspring of the birds would then fly from the ashes, and carry priests to the temple altar in Heliopolis. In ancient Greece, it was said the bird does not eat fruit, but frankincense and aromatic gums. It also collects cinnamon and myrrh for its nest in preparation for its fiery death. In Asia, the phoenix reigns over all the birds and is the symbol of the Chinese Empress and feminine grace, as well as the sun and the south. The sighting of the Phoenix is a good sign that a wise leader has ascended to the throne and a new era has begun. It was representative of Chinese virtues: goodness, duty, propriety, kindness, and reliability. Palaces and temples are guarded by ceramic protective beasts, all lead by the Phoenix. Due to the themes of death and resurrection, it was adopted a symbol in early Christianity, as an analogy of Christ’s death and three days later his resurrection. The image became a popular symbol on early Christian tombstones. It is also symbolic of a cosmic fire some believe created the world and which will consume it. A reborn Phoenix. A ventral view of the bird between two trees, with wings outstretched and head to one side, possibly collecting twigs for its pyre but also associated with Jesus on the cross. In Jewish legend, the Phoenix is known as the Milcham – a faithful and immortal bird. Going back to Eden, when Eve possessed the apple of knowledge, she tempted the animals of the garden with the forbidden fruit. The Milcham bird refused the offer and was granted for its faith a town where it would live in peace almost eternally, rebirthing every thousand years, immune to the Angel of Death. It represents the changes during chemical reactions and progression through colors, properties of matter, and has to do with the steps of alchemy in the making of the Great Work, or the Philosopher’s Stone. Continually morphing and morphing, the phoenix represents the idea that the end is only the beginning. 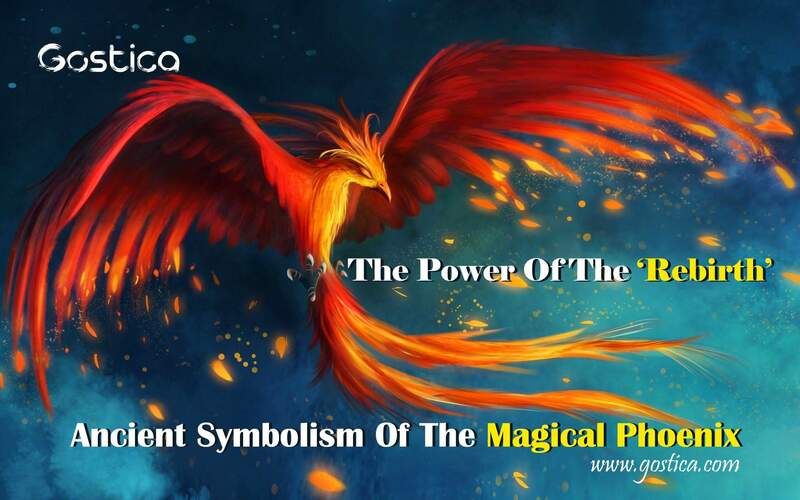 Much like this powerful myth, the symbol of the Phoenix will be reborn over and over again in human legend and imagination.